Winmate offers 20.1" 1600x1200(UXGA ) Display high performance LCD module to be integrated into our High-end Product lines.We select 1600 x1200 high resolution panel which supports 16.7 megapixels with 8 bits number of colors. 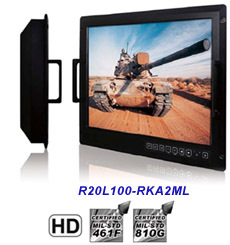 This provides High definition visual quality that meet customers in high-end applications. With embeds Intel ® Core i7/i5 multi-core processors also known as Intel 5 series system chipset (HM55) in Industrial Panel PCs , 20.1 inch HD All-in-one PPC has high CPU performance and with optimized processor power consumption which allows active processor cores to run faster than the base operating frequency when certain conditions are met. 20.1"Military Grade Rugged Console Display is designed for a rough terrain and harsh weather conditions which having shock and vibration safeguards.Our Military Grade Display also has tested for bothMIL-STD-810G environmental and MIL-STD 461F EMC standard.Providing a longer lifetime, high image quality, and wide range of temperatures and anti-corrosionmechanical protection. Our Military Display is able to stand up in battle filed and integrates most advanced technologies available. For Winmate's Marine solution series, Marine Bridge System LCD Displays and Marine Panel Computers are the best solutions for maritime applications such as Navigation, Monitoring & Surveillance, and Ship Automation. All Marine series product design follows IEC 60945 fourth edition (2002) Maritime Navigation and Radio-communication Equipment and Systems requirements and IACS-E10 for international standards. EAC/Marine was born to industrial automation and M2M (machine to machine) applications. Intel Ultra Low Voltage processor, RS232/422/485serial ports with isolation and auto-direction function, two RJ45 Gigabit and eight Digital Input / Output ports fulfilling the most of demands. All Winmate Marine series products design and testing are according to DNV Standard for Certification 2.4, IEC60945 and IACS-E10. For the industrial display series, Winmate has the size of 20.1" with 1600x1200 resolution CCFL backlight, and also provides 20.1" Sunlight Readable displays enhance panel PC systems in terms of brightness, dimming range and viewing pleasure. Such characteristics are superior to regular LCD PC& Monitor. These products can be used for special mounting applications, especially in POS,KIOSK,CAR TV&Navigation System,Gaming/Casino Machine,Factory Automation,Information Terminal and Panel Wall.